The match between Manipur and Arunachal Pradesh in Kolkata saw 23 wickets fall on day one. 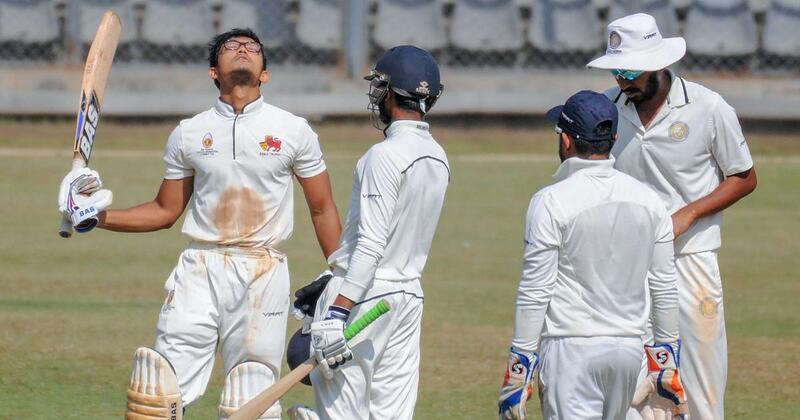 Mumbai opener Jay Bista rediscovered his form with a splendid century to lay a solid foundation with his partner Vikrant Auti before Saurashtra fought back on day one of their Elite Group Ranji Trophy match on Saturday. Bista slammed 127 off just 150 balls studded with 21 hits to the fence and also put on 174 runs with fellow-opener Auti (57) before the visiting team’s bowlers, led by left arm spinner Dharmendrasinh Jadeja (3 for 89), triggered a collapse post lunch taken with the hosts at a commanding 122 for no loss. The hosts were left reeling at 232 for five before captain Siddesh Lad, with a responsible 84 in 115 balls with 12 fours and a six, and all rounder Shivam Dube (34) stemmed the rot with an unfinished partnership of 102 for the sixth wicket that helped Mumbai end the day at a healthier-looking 334 for five. The morning belonged to Bista who raced to his half century in just 63 balls, striking seven fours off left-arm pacer Chetan Sakariya, and also helped Mumbai record their first century stand for the first wicket of the season. At lunch, he was on 95 after facing 110 balls and then completed his fourth first class hundred in just 116 balls. But once Bista fell caught at extra cover off Jadeja who secured some turn and bounce off the Wankhede Stadium track, the slump followed with Mumbai losing two more wickets in 9 balls and with just 7 runs added to be 198 for three. Jadeja added the wicket of Shreyas Iyer, who had cracked a blazing hundred in the previous game against Baroda a day after returning from New Zealand, while Auti fell to rival skipper Jaydev Unadkat. Shubham Ranjane too departed not too much later as Mumbai lost four wickets for 37 runs in the second session before adjourning for tea at 222 for 4. Soon after tea, Aditya Tare was dismissed by Jadeja for his third wicket at 232 before Lad, playing his now familiar anchoring role , was joined by Dube and the two repaired the rocking boat with a partnership of for the sixth wicket. Centuries by captain Akshdeep Nath and Priyam Garg helped Uttar Pradesh dominate the opening day of their Ranji trophy Group C encounter against Tripura in Lucknow on Saturday. At stumps, Uttar Pradesh were 257 for 4 with Garg and Rinku Singh batting on 113 and 13 respectively. A disciplined bowling effort helped Himachal Pradesh bowl out Tamil Nadu for 227 in 78.4 overs on the opening day of the Ranji Trophy Elite Group ‘B’ match on Saturday. In reply, the host lost the wicket of captain Prashant Chopra (5) to end the day at 25 for 1. Electing to bat after winning the toss, Tamil Nadu was in trouble early, losing both the openers - N Jagadeesan (3) and Abhinav Mukund for a duck. While Arpit Guleria struck the first blow for HP, trapping Jagadeesan leg-before wicket, Pankaj Jaiswal had the consistent Mukund caught behind by Ankush Bains. This brought together Baba Aparajith and his twin brother, Indrajith, the captain. The duo was involved in a 62-run partnership as the visitors recovered from the early jolts. Jaiswal was the most successful bowler for HP with 3 for 45, while Guleria, Raghav Dhawan and Chopra took two wickets each. 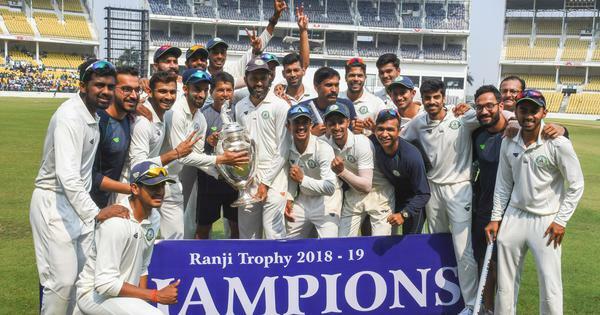 Manipur on Saturday bounced back after being bowled out for 85 to take firm control of their Ranji Trophy Plate Group match against Arunachal Pradesh on a day 23 wickets tumbled in Kolkata. A seaming track at the Jadavpur University Salt Lake Campus on offer, Manipur crashed to 85 all out after being put in to bat. Deendyal Upadhyay (5/38) was the wrecker-in-chief as the Manipur’s innings folded inside the first session. In reply, Arunchal Pradesh were skittled out for 66 inside the second session with Thokchom Singh (5/16) and Bishworjit Konthoujam (4/27) sharing nine wickets between them to hand ther side a slender 19-run lead. Manipur batted sensibly in their second innings, ending the day on 192/3 with an overall 211-run lead. In Nagpur: Gujarat 263 for 6 (Kathan Patel 105 , Dhruv Raval 69 not out , A A Sarvate 2/57) versus Vidarbha. In Shimoga: Karnataka 208/9 (Siddharth K V 69, Dega Nischal 52; Avinash Yadav 3/43) versus Railways. In Patna: Bihar 150; 46.1 overs (Harsh Singh 48 not out; Rachit Bhatia 6/44). Nagaland 101/4; 41 overs. In Visakhapatnam: Bengal 194 for 6 in 78 overs (Manoj Tiwary 90, Agniv Pan 39) vs Andhra. In Hyderabad: Hyderabad 240 for 7 in 90 overs (Tanmay Agarwal 60, Akshat Reddy 77, Himalay Agarwal 51 batting, Mayank Markande 3 for 65) vs Punjab.